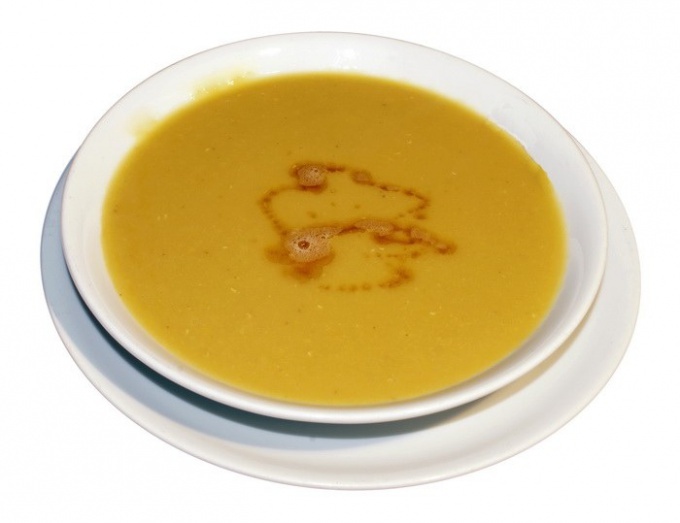 To mucous include soups that do not contain dietary fiber and extractives of fish, meat, mushrooms and vegetables. For preparation of mucous soups use different cereals. Such soups are the basis of extremely strict diet in which you take care of the mucous membranes of the intestines and stomach, minimizing the chemical and mechanical action. To prepare this soup, selected cereals (except oats and semolina) thoroughly washed in quite warm water, and then poured in a pot of boiling water, then cook under lid on low heat until the cereal is completely mushy. The resulting mass is thoroughly filtered through cheesecloth, but grits through it do not wipe. The only exception is the broth of monkey, it is not necessary to strain. The resulting mucilaginous, thick broth bring to a boil and then remove from fire. In parallel, boil the milk, cool it a bit and add a raw egg. The resulting mixture should be thoroughly mixed, then pour in the prepared broth. The resulting soup is added sugar or salt before use, put a bit of butter. This soup can be repeatedly heated, not boiling, so the egg doesn't curdle cereal. To speed up the cooking of such soup can, previously having touched several times and rinse the groats. Further it is possible to dry in oven, cool and grind in an electric coffee grinder or hand mill. Slimy soup can be cooked and on the basis of rather weak beef broth. It diversifies the diet, if you have time to adhere to such a strict diet. It is best to cook this soup with barley. You need to cook the broth, strain and cool. Fine ground barley carefully sort, wash in hot water, pour boiling water and bring to cooking, it takes two to three hours. The resulting mass of strain through several layers of cheesecloth. Then you need to add to the slimy broth rather weak meat broth to taste. Before use, put in the dish a small piece of butter. Such mucous soups you can feed very young children and elderly people with problems in the gastrointestinal tract. Instead of cereals you can use regular bran, but they need a good pressing after straining, because they absorb a lot of fluid. With the deterioration of the inflammatory processes in the intestine or the symptoms of diarrhea need to cook oatmeal and rice soups on the water without adding milk. Rice is one of the most useful products for the stomach as it is very easy to digest. And the oatmeal has a beneficial effect on the intestines and stomach, because it has a lot of fiber, which soothes mucous membranes, enveloping them.